It takes a lot to freak me out, as a child I had the kind of bedroom that most of my friends thought was pretty wierd…lots of creepy old stuff, masks, dusty books, moth-eaten old fur stoles from long dead great great aunts….a distinct lack of anything girlie and pink. Like many children I was compelled to go for piano lessons. I hated them. But I loved my piano teacher (a close family friend) and her house – she and it were like something out of another era. The house was packed full of antique furniture and strange knickknacks. Mrs A had lived in the far East for a time, and from what I gather, lived in rather grand style. Even in her old age there was very much something of the Grand Dame of the British Empire about her. Despite her sometimes imperious manner, she also had a wicked sense of humour, and owned possibly one of the most terrifying dolls I have ever had the misfortune to encounter. 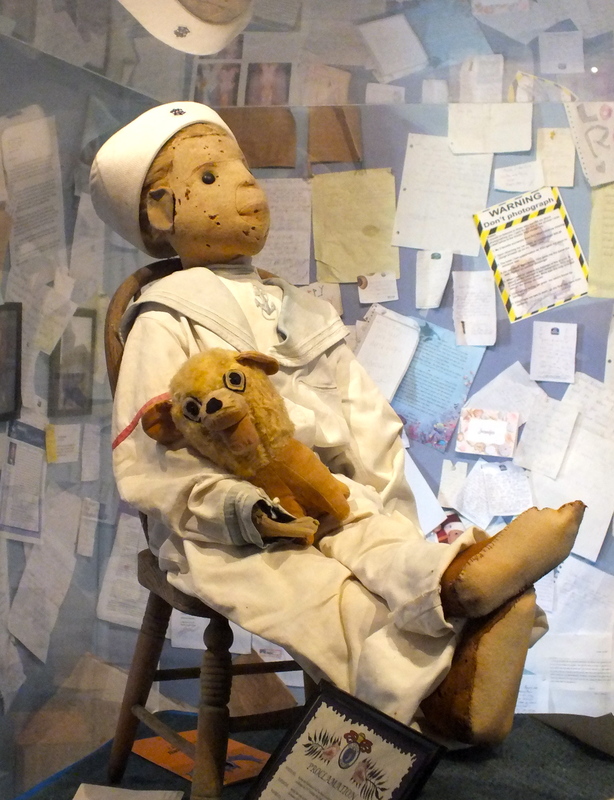 I remember the very first time I saw the doll – I must have been 6 or 7 and I remember loathing it on sight. It was a Victorian Porcelain doll, with (I swear) GREY hair, glassy staring eyes and a mean little mouth. And worse of all at some point during its existence the doll had undergone some kind of cranial autopsy courtesy of Hannibal Lecter because the entire top of its head came off – grey hair and all (as Mrs A loved to demonstrate) – leaving its gimlet eyes staring at you with nothing but empty air above them. If I managed to hold my nerve when the doll came out to play, I definitely lost it when Mrs A invariably lifted its ghastly lid. If ever a doll was possessed, as a child, I was convinced that one was….which brings me neatly to the subject of this post. 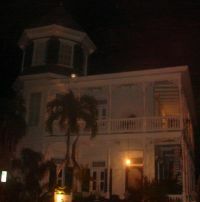 The Otto home, Key West, Florida. Image source unknown. The story of Robert the doll begins in the early years of the twentieth century in Key West Florida in an elegant mansion on the corner of Eaton and Simonton Street. The Otto family had lived in the house since the mid 1890’s and if you believe the rumours, they were non to kind to their servants. The Otto’s young son Robert Eugene was particularly fond of a Bahamian maid who was employed to look after him. The maid was dismissed in 1906, some say for practicing Voodoo, others that Mrs Otto was jealous of Robert’s fondness for the girl. Before she left, the girl made a 3 foot tall, button eyed, straw doll for Robert. Robert adored it. The doll seemed to exert some kind of hold over the young Robert. He is said to have begun using his middle name Eugene or Gene because he said the doll’s name was Robert. Soon servants began to leave and the family became convinced that the Bahamian maid had somehow cursed the doll. 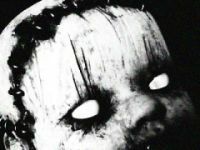 The doll was banished to the attic of the family home…it is said that the aunt who put him there died of a stroke that very night. Despite his banishment rumours persisted…the sound of tiny footsteps and childish laughter was often heard in the attic…. As Gene grew to become an adult he became an artist and married. When his parents died he inherited the old family home and he and his wife Annette moved back in. It was not long before Gene found Robert in the attic and the two were reunited. The adult Gene was constantly accompanied by Robert much to the distaste of his wife, who is said to have loathed the doll. Eventually Annette, exasperated by Gene’s obsession with the doll, exiled Robert once again to the attic. He does not seem to have liked that and Gene is said to have told Annette that Robert had demanded a room with a view of the street. Naturally Gene obliged and fitted out the Turret room, his studio, for Robert. Gene would spend hours locked away painting and talking to the doll. Rumours soon spread about the neighbourhood, children going past the mansion on their way to school would try not to look up at the turret room because Robert had been seen staring malevolently back at them. Worse still, he had been seen running from window to window when the family were out. People said that the doll was filled with evil voodoo relics, tiny animal bones, had a crystal heart, had human hair…was possessed by evil. 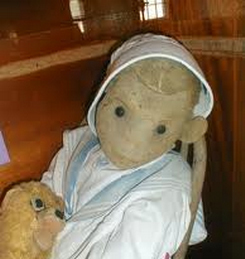 Popular tradition also embroidered the legend to say that Annette died insane because of the cursed doll. Whether this is true or not, when Gene died in 1974 Annette was sane enough to get out quickly and leave Robert behind. It is said that Gene Otto’s will stipulated that the house could be leased but that Robert should be left in peace. The new family who took over the old Otto house had a 10-year-old daughter and with the typical perversity of childhood when she saw Robert, she loved him. Robert however had less than affectionate intentions towards his new owner and soon the girl was having horrific nightmares and had become convinced the doll was trying to kill her. Even decades later she is still convinced that Robert did attack her and try to kill her. It was her terrified family who donated Robert to the Fort East Martello Museum where he resides today. Robert sits safely behind glass in the Museum, travelling once a year to the Old Post Office to be displayed and occasionally featuring in paranormal conventions. Yet despite being over 100 years old, and looking a little worse for wear, Robert is still a force to be reckoned with. Museum staff claim he has been found in different positions, cameras break in his presence, footsteps are heard around the museum at night, and his expression is known to change in a way that can chill the blood. 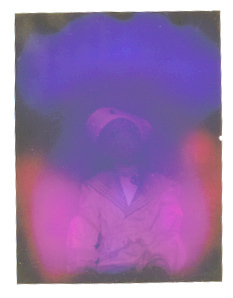 Visitors are advised to seek Robert’s permission before photographing him, or risk being cursed, in fact letters from apologetic photographers cover the walls of his display cabinet. Many people visit Robert as skeptics and leave convinced that there is something to the story. But how much of the story is real? Could it be that an affluent white family chose to blame the disturbed behaviour of their son on the evil magic of a black servant? Was this easier to believe than that their child may have had a mental illness? None of the sources that I have found on the internet have named the ‘Bahamian Servant’ or provided any substantial detail about her, so her story is unheard. Has an act of fondness been twisted into a tale of black magic and revenge? Is it also not possible that Robert Gene Otto, dropped the name Robert, simply because his father was also called Robert? Perhaps it was easier for the family to distinguish between the two of them that way? 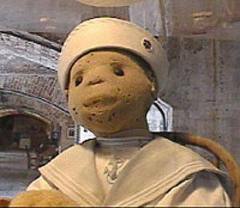 The voodoo (or should that be hoodoo) association is enforced by the long-held belief that Robert the doll’s hair is made from human hair, more precisely the hair of Gene Otto himself, and that it has grayed over time. However, tests have revealed the hair to be a natural fibre such as wool. You can visit Robert at the Fort East Martello Museum. I originally posted this review on http://www.ingridhall.com, but it seemed in keeping with my blog so I decided to post it here as well…. Rachel Patterson, also known as Tansy Firedragon, is an experienced witch and a Wiccan High Priestess. Rachel was lucky enough to study with the highly respected Janet Farrer and Gavin Bone on their Progressive Magic Course. She is also familiar with Shamanism, hoodoo and tarot and many other pathways; she has links to the Order of Bards and Druids. She is also the founder of the Kitchen Witch Online School of Witchery. This book is a concise guide to practical hoodoo. Coming in at under 100 pages it contains a brief introduction to the historical origins of Hoodoo (African-American Folk-magic and root work, as distinct from the religious practice of Voodoo). The book contains well-defined sections on all of the main topics including types of root work: laying tricks and jinxes; spiritual washes; candle magic etc. The book also provides a plethora of useful recipes for powders, washes and conjure oils including some new, and some old, such as the wonderfully named Bend Over Oil (it’s not what you think – it is intended to bend another to your will….oh well on second thoughts..I suppose actually it could be for that too…). It also provides a brief introduction to various relevant deities and spirits, glossary of terms and some useful sources for further study. I know very little about Hoodoo,other than what I have picked up from a variety of cheesy horror films, so I was very curious to find out more about this subject. As it happened I found the subject explained in a fascinating and straightforward manner. I was intrigued by the similarities and dissimilarities with European Witchcraft and the incorporation of elements of Christianity. One of the aspects that I found undeniably enticing but also a bit scary related to the dark side of Hoodoo practice. Patterson is a witch of many years standing and as such is clearly aware of the ‘And it harm none’ philosophy of modern witchcraft. However, hoodoo does not appear to have such caveats – and Patterson fully acknowledges this and gleefully delves into its dark side. Although she does warn that if you use magic for harm you are likely to receive harm in return this is not overly stressed in the book, and I think that possibly the Hoodoo philosophy here isn’t so much ‘Do what thou wilt, an it harm none’ but ‘Do what thou wilt – but don’t get caught!’. After one particular section on laying tricks on an enemy I had an admittedly hilarious but worrying image of some over-keen Hoodoo newbie lobbing a bottle full of coffin nails, graveyard dirt and bodily fluids at the porch of some unfortunate neighbour and ending up with an Asbo! Nevertheless, Hoodoo is not all about laying jinxes on your mortal enemies (tempting as that might be) it is primarily about positive and beneficial magic designed to improve your life, and although not a religion in itself, does form part of the practices of many religions such as Haitian Vodou, Cuban Santeria and West African Yoruba and as such should be given due respect. I very much enjoyed this book, and probably will try some of the recipes for incense and washes – although will probably steer clear of jinxing anyone! As a keen history geek I would have loved a bit more on the history of the this tradition and the deities involved, but as the aim of the book is to present a practical guide for hoodoo practitioners history clearly wasn’t its primary focus. Patterson did however provide some fascinating biographies of some of the famous names associated with Hoodoo, such as Doctor John and Marie Laveau – I will definitely be doing some further reading on these intriguing characters. Patterson presents a very individual interpretation of Hoodoo for the modern, possibly urban practitioner, an audience possibly with other Craft experience but who has not necessarily been raised within the traditions of hoodoo. As such it is not pure ‘traditional’ hoodoo – and some may object to this. Importantly Patterson is strongly against the sacrifice of animals for rituals or spells (here here!) but does suggest some harmless and innovative solutions to this aspect of the practice. I would say that this book’s ideal audience of potential practitioners might be those who already have some expertise in their current field of magic – some of the practices might be a bit ‘strong’ for newbies – and after all as the author points out no magical practice should be undertaken lightly and without proper precautions. All in all though it was an entertaining and informative book about a very misunderstood and maligned area of magical practice. Hoodooo Folk Magic by Rachel Patterson is due to be published by Moon Books on 30 August 2013.